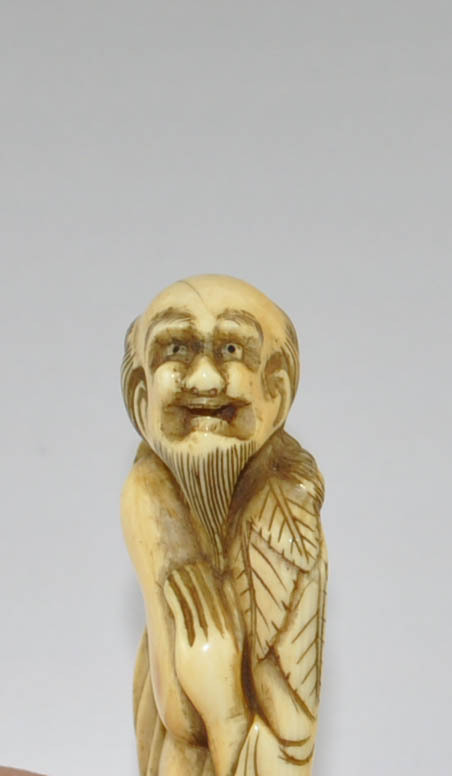 Ivory Netsuke depicting Chōkarō sennin. The attribute of this sennin is traditionally the gourd from which he produced a magic colt or mule that could, when required, carry him thousands of miles in a single day. In this netsuke the carver depicted the tall figure with the head turned left to make the best use of material he had available. The immortal holds the magic gourd with both hands. The Chinese-style dress and the cloak of leaves are carved following a symmetrical pattern on both sides.